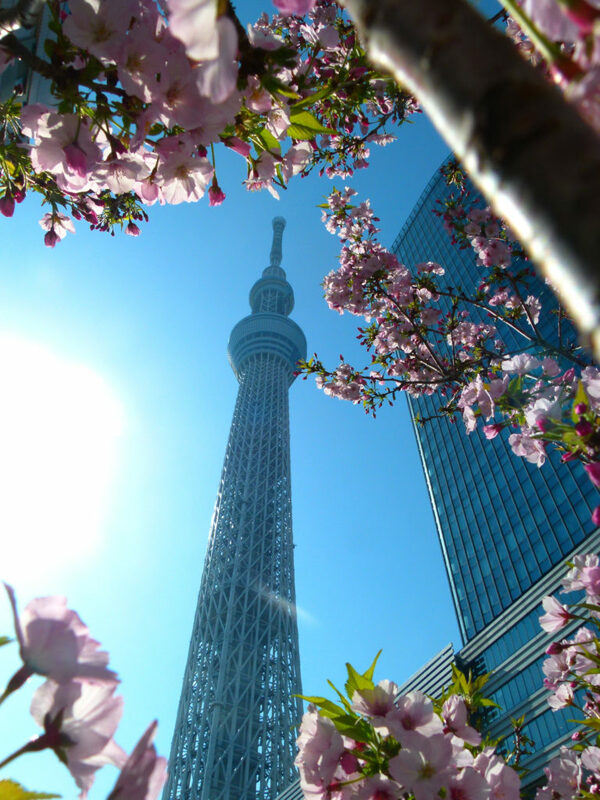 Cherry blossom season is here, and you know what that means…it’s Hanami Time! For those who don’t know, “hanami” is Japanese for “cherry blossom viewing” and is incredibly popular in Japan. 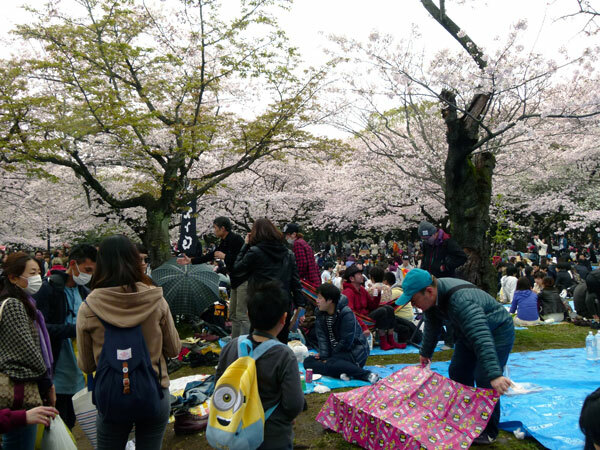 People go out in droves to the parks to have picnics and drunken parties under the cherry blossom. 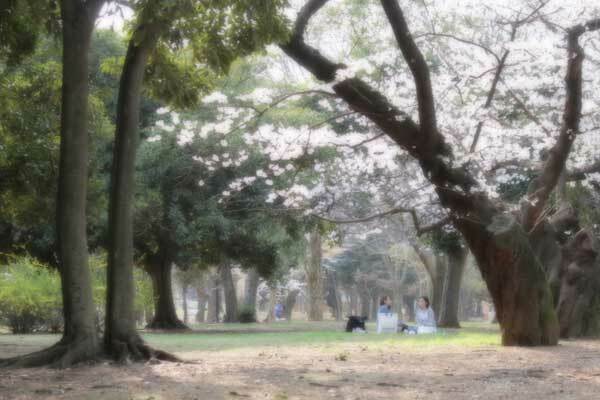 So, for those new to the hanami culture, here are some tips on how to make the most of your hanami experience. 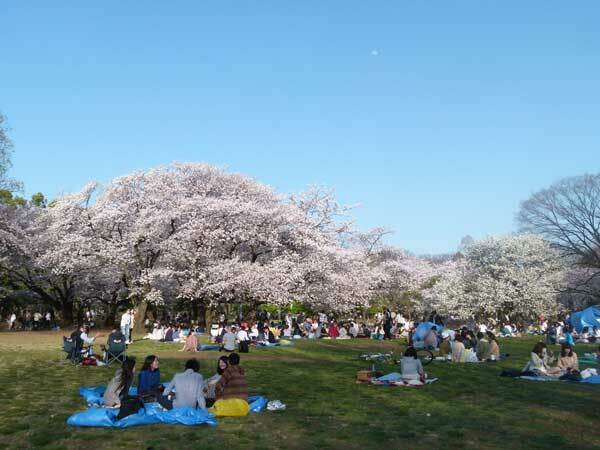 People lay out their ground sheets to reserve places around the cherry blossom trees. Picnic blankets just aren’t done here. Instead, people opt for the more practical ground sheet. They’re big, cheap, and waterproof. Most people have the glaringly ugly blue ones, but you can buy nicer cherry blossom-themed ones (as well as other hanami picnic goods) at most 100 yen shops during this season. If there’s one thing the Japanese are well-practiced in, it’s waiting. Queues abound for anything minutely popular in Tokyo, and you can expect to see people camping out with their ground sheets in Ueno or Yoyogi Park at 6am in order to reserve a spot for the afternoon. If you want the best spots nearest the cherry blossom, you’ll need to get there early. You can probably just go and leave the ground sheet there, but there is a chance someone might move it. It’s really up to you how badly you want to secure that prime real estate. If you’re not that bothered, you can always enjoy the cherry blossom from afar. Yoyogi Park on a weekday near the cherry blossom trees. The weekdays are crowded, but the weekends are packed! If you can at all help it, going on a weekday is recommended. There will be more room for you to enjoy the area, and you still get that party buzz of people around you. You can see more here. The website is in Japanese, but a quick copy-paste of the place names into Google will show you the English names as well as pictures of the area. As the name suggests, the website meetup.com is great if you want to meet new people and hang out. 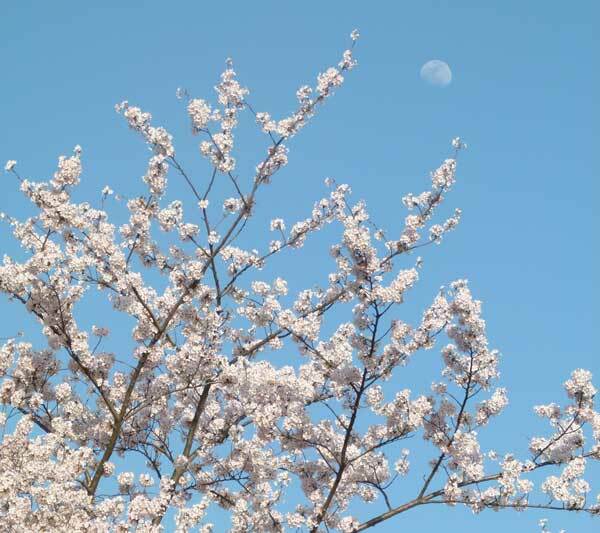 Since it’s cherry blossom season, everyone plus their grandmother’s 2nd cousin twice removed is going to be doing hanami, so there are plenty of events that you can join. Hanami parties are always more fun in a group, and the best part is, you can leave all the prep up to the organizers. No camping out at 6am in a cold park for you!